Keogh, Theodora. The Fascinator. New York: Farrar, Straus & Young, 1954. —. My Name is Rose. 1956. New York: Signet, 1958. —. The Tattooed Heart. 1953. New York: Signet, 1954. 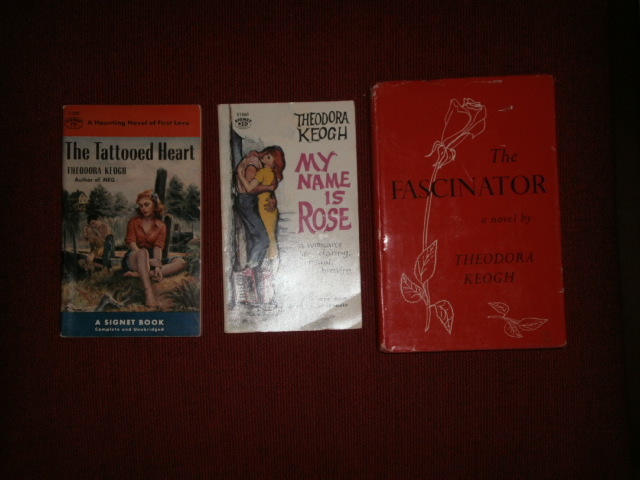 Theodora Keogh is my latest literary obsession, so I’ve been buying her out-of-print books on amazon.com as I find them (several of her novels have been reprinted by Olympia Press, thus I have been focusing on acquiring the out-of-print ones first). I love the look of old pulp fiction, and these editions are still in good condition because Signet was smart enough to produce them with colored page edges (I’m sure there is a technical term for this, but I don’t know it, which is terrible) to help protect the pages. I remember my elementary school librarian, Charles Kolataze at P.S. 97 in the Bronx, teaching us that books with this feature would last for years and years, but books without it would maybe only last for ten. Now, it is ridiculous to say that any book, even one being handled often by grubby children’s hands, will only last for ten years–see Nicholson Baker’s excellent exposé of this and other ridiculous librarian myths, Double Fold: Libraries and the Assault on Paper–but it is true that books with protected edges stay in good condition. The first edition of The Fascinator (great title!) is also, well, fascinating, as it gives a glimpse into Farrar, Straus and Giroux’s (Why don’t they use the Oxford comma??? Arghhh.) early history. That third partner slot was apparently an unstable one, as The Fascinator has Young as the third partner and My Name is Rose notes that it was first published by Farrar, Straus & Cudahy.